The DeepVeer reception at Grand Hyatt Mumbai is under way and despite the lack of clear pictures of the guests and the venue, we're doing okay. At least we know what the bride and groom are wearing. 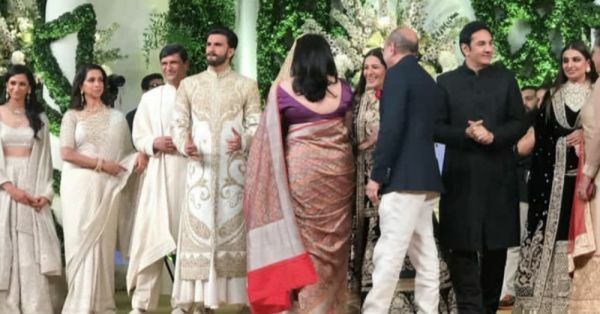 An observation worth making: while both Ranveer and his bride wore opulent Indianwear in ivory and gold, the families decided to go in opposite directions (of the colour spectrum) when it came to their ensembles for the reception. Ranveer's side aka ladkewale slipped into striking black ensembles - each and every one of them - and gave us #famgoals for real. Starting with the most elaborate outfit on the Bhavnani side, Ranveer's mother Anju Bhavnani wore a black kurti, lehenga and dupatta ensemble covered in glittering gold embroidery. Ritika Bhavnani, Ranveer's sister, also wore a black and platinum gold outfit. With black on the top, a big, sparkling gold border at the bottom and a matching dupatta to finish, she nailed it. Bhavnani Senior skipped the drama and wore plain black, H2T. Jagjit Singh Bhavnani wore a black sherwani with black pants and matching shoes. 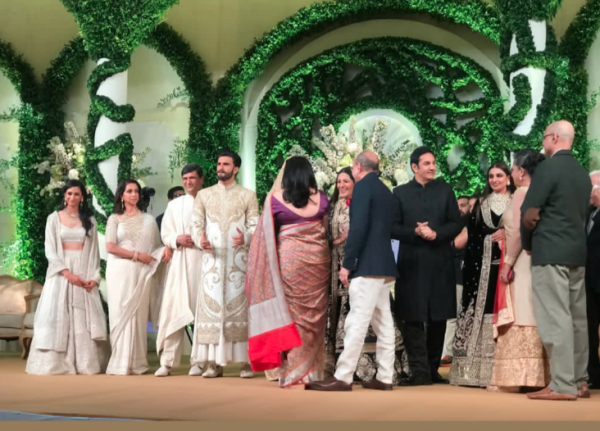 Deepika's side of the family chose to add some contrast to the stage by wearing white. Yes, the ladkiwale looked like a choir of angels standing by Ranveer's side, greeting the guests. Prakash Padukone, DP's father, paired a white kurta with matching bottoms and draped a white stole over his arm. Doesn't he look handsome? We're equally impressed by mommy Ujjala, who chose a simple pearly white saree and a sleeveless blouse for the reception. Deepika's sister Anisha slipped into a lehenga-choli ensemble, which she layered with a light dupatta cape around her shoulders. What a win for twinning, isn't it? Colour coordination at this large a scale...it happens only in Bollywood, amirite?